There aren't many American cars left like the 2014 Dodge Charger: Four doors, a powerful front-mounted engine, rear-wheel drive, affordably-priced. Cars once as common as potato chips at a picnic now number a very few. One of the last of a breed, the Charger is also one of the best and packs a lot of get up and go for the money. The cruise control that keeps pace with the vehicle in front of you. I was skeptical at first but it was something my husband wanted. After driving it a few times I couldn't believe how comfortable it was in the driver and passenger seat. It drives smoothly almost to the point you have to look down to make sure you are not speeding because you wouldn't realize it if you were. Mine has heated and cooling seats up front heated steering wheel heated seats in back. A back up camera and sensors for your blind spots. It even has two cruise controls, one is regular the other keeps in pace with the vehicle in front of you. It slows you slow, it speeds up you speed up. Automatic start which is nice in the winter months. It was a good choice for me. I love how comfortable and roomy my car is, yet it still has a sporty look to it. It's very peppy and has a nice dash area with touch screen radio and climate control buttons. This really would be my all-time favorite vehicle if not for a few things: there has been an ongoing transmission issue which ultimately came to light when there were several recalls that required me to go back to the dealership for repairs. Also, I would really love to be able to connect my phone to Bluetooth for hands-free talking and would love to have the option for satellite radio, but I don't.. It is a very fast car and sometimes you do not realize how fast you are going. My car is extremely comfortable and very sporty. I get many compliments from people I do not know. I get around 20 miles to the gallon which is fairly good for a sports car. It can be driven year round through snow and ice. It is the only sports car that is available in all wheel drive. It has comfortable heated leather seat in the front and back. It has voice command and Bluetooth access. 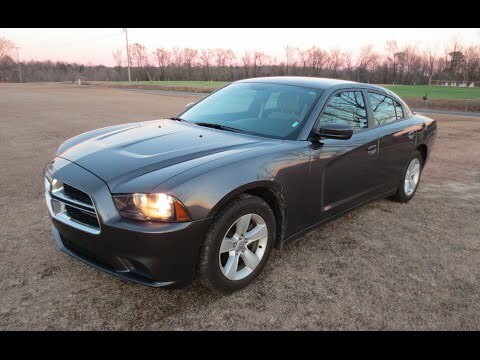 When it is time for me to purchase a new vehicle I will definitely purchase another Dodge charger. They come in many sporty colors to choose from. I highly recommend Dodge chargers. Chrysler (FCA US LLC) is recalling certain model year 2011-2014 Dodge Charger vehicles manufactured May 6, 2010, to June 5, 2014. In the affected vehicles, the side impact sensor calibrations may be overly sensitive, and as a result, the side air bag inflatable curtains and seat air bags may unexpectedly deploy and the seat belt pre-tensioners may activate. Chrysler will notify owners, and dealers will update the Occupant Restraint Control module calibration, free of charge. The recall began on August 25, 2015. Owners may contact Chrysler customer service at 1-800-853-1403. Chrysler's number for this recall is R35.